And he has a point, at least as far as I’m concerned, because I will always choose a burger over a salad. ALWAYS. This was mostly because it was 48 hours before the wedding and I had a gorgeous dress to wear—a dress that had a low scoop back which prevented the wearing of any kind of Bridget Jones’ style fancy pants. But much to my delight, the salad was amazing; baby spinach and rocket tossed with toasted walnuts, roasted pumpkin, fresh asparagus and grilled haloumi. All topped off with honey balsamic dressing. Ah-may-zing. (And yes I did google the menu to get that description). Anyway, after that exciting first date with salad, I vowed that come the new year I would make more of an effort to be friends with salad. 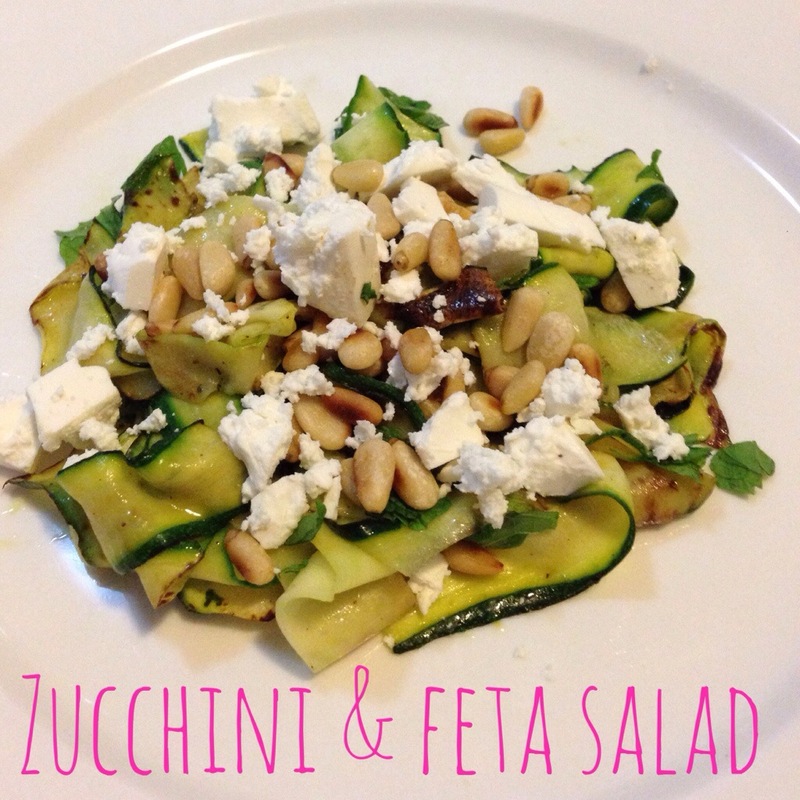 And while you don’t win friends with salad, I’m pretty sure you’ll always win them with cheese, which is why I started with a Zucchini and Feta Salad which isn’t just delicious but it only takes 10 minutes to make AND uses just four ingredients. That’s right, FOUR. Zucchini. Pine nuts. Feta. Mint. I know, you’re probably questioning whether zucchini belongs in a salad and I tell you, the answer is yes and I’m not even a big zucchini fan. But this, this is good. 1. Cut the ends off the zucchini and then cut into long thin slices (I prefer to use a vegetable peeler). Place into a mixing bowl and drizzle with olive oil, salt and pepper and cook on the barbecue or in a hot pan until browned and cooked through. 2. Meanwhile, cook the pine nuts in a small pan until they are a pale golden colour. 3. Put the zucchini and mint on a plate and scatter with pine nuts. Crumbled over the feta and season with salt, pepper and lemon juice. Note: You can also add currants to this recipe, just cook them with the pine nuts. For a bit of added bite, add 1-2 red chillies, de-seeded and finely chopped at the end. You can also add baby gem lettuce cut into ribbons for added filling.